What is the inherent value of a forest? Is there an achievable compromise between human and preservation concerns within forest management? Jim Furnish, author of newly released Toward a Natural Forest, knows firsthand how difficult these questions can be to answer. A former US Forest Service deputy chief, Furnish draws greatly upon his own experiences in the agency to create a contemplative memoir that is as thought provoking as it is informative. Furnish joins us today to share his hopes for the future of forest stewardship in the United States. What is the gestation period of a book? Several years in my case, made longer by being a forester, not a writer. The hurdle involved moving beyond stories and anecdotes to a real message. I believe that today’s conflicts over forest politics and policies speak to a deeper clash over values. Our national forests, managed by the US Forest Service, have become a crucible for a hoped-for solution to the age-old question: “How do we get what we need from our forests without ruining them?” My book attempts to answer this question. Thanks to Teddy Roosevelt and other far-sighted conservationists, the Forest Service is blessed (some might say saddled) with the responsibility of managing our national forests: a stunningly beautiful and resource-rich public estate that accounts for nine percent of the country’s landmass. Devoted public servants – our legendary “forest rangers” – built a lofty, can-do reputation that crashed suddenly in the late 1900s, epitomized by the northern spotted owl controversy. Decades of ambitious logging in these vast, natural forests clashed with a growing awareness of heavy environmental costs and citizens clamoring for an agency that cared more about the values of common people than timber industry profits. The crash yielded a dispirited, wounded Forest Service confused about the future. Humpty Dumpty could relate. I observed the growing animosity through an internal lens; I was actually one of those guys responsible for all the trouble. Yet, my immersion in the roiling waters of conflict left me troubled, colored, and ultimately changed to become, yes, an environmentalist. Because the Clinton administration sought leaders with a stronger land ethic, this personal transformation resulted in my promotion to become a high-ranking deputy chief in 1999, a cherished honor. How strange though, after a 35-year career, to then find myself persona non grata and leaving the agency I loved for reasons of principle. Toward a Natural Forest chronicles twin tales – mine and the Forest Service’s – of tumult and transformation, set against the restive environmental movement. Environmentalists turned increasingly and successfully to the courts for redress, which imposed severe restrictions on logging public lands. The Forest Service seemed lost, floundering to fashion a future. As supervisor of Siuslaw National Forest on Oregon’s coast, I confronted an organization in free-fall with no viable vision. My memoir relates the journey from despair to hope, building a new forestry paradigm based on restoring naturalness to a landscape. We turned our focus to improving water quality, fish and wildlife habitat, and recreation opportunities, rather than simply producing wood products. The environmental community – former foes – enthusiastically supported the changes. The timber industry, whose supply of wood was much reduced, accepted a different and smaller role. For the first time in decades, the timber wars ceased. I speak hopefully of a different and better future, a future that stewards forests humbly and respectfully to sustain their inherent functionality and worth. How much are our public forests worth? Far more than money. I contend they are priceless. Jim Furnish is a consulting forester in the Washington, DC, area following a 34-year career with the USDA Forest Service. He has served in a number of leadership positions within the agency, including a stint as deputy chief and supervisor of Siuslaw National Forest. Passionate about the protection of forested lands, Furnish was instrumental in creating the Roadless Area Conservation Rule and garnering support for a restorative policy over timber production in the Siuslaw National Forest. You can purchase his new book, Toward a Natural Forest, here. 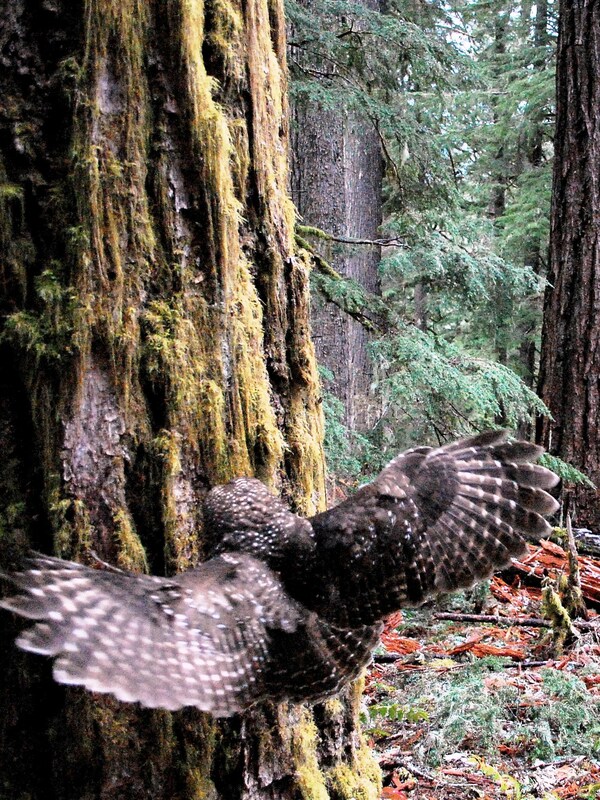 Photo of Northern Spotted Owl taken by Oregon State University student Kristian Skybak, used with permission from Oregon Wild.